DigitalNZ brings together more than 30 million items from institutions such as Auckland War Memorial Museum Tamaki Paenga Hira so that they are easy to find and use. We added this one from this URL on 04 March, 2016, and last updated what we know about it on 20 July, 2018. This item is an image. It was created by an unknown creator on or around the date published: Nov 1949; time period: 1940s. 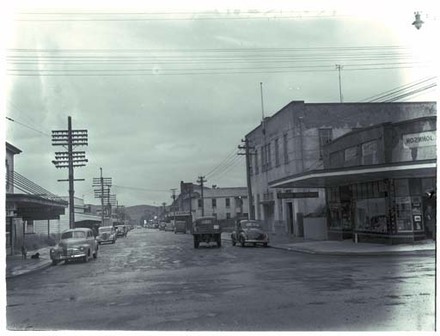 Town street scene with retail shops signed 'Johnson, Sports, Goods, Drapery' and 'Beehive General Storekeepers', the Kaikohe Post Office and hotel[?]. Cars and power lines line the street. This item is all rights reserved, which means you'll have to get permission from Auckland War Memorial Museum Tamaki Paenga Hira before using it.